Yep, must continue to ask, as, there are new folks around here that may not know the near legendary search that I have been making for well onto "nigh" ten years now! Looking for good color on the film. A really good movie and series!!!! I love Grisley Adams as well. I purchased Season 1-2 on Dvd through walmart .com. 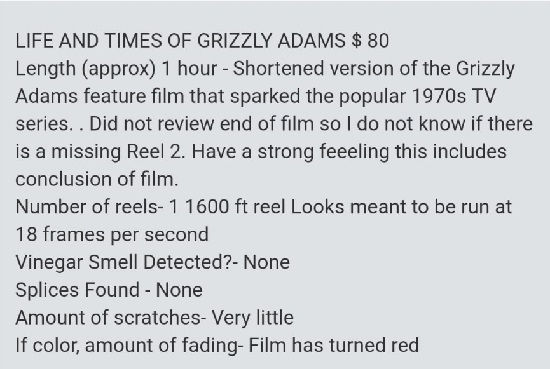 I am so glad I did this way My mom and I can enjoy those wed night memories of watching Grizzley adams. The man whom tamed bears is actually burried hear in massachusetts. Live life to the fullest each and every day. You never know when you will be called home to Glory. I so want to, and we are working again, (well $350.00 approximately per month, part time), but it all comes down to have the available cash to do so. If some comes up, I'll certainly be there, with some optical sound and otherwise rarities! I so would love to meet ya in person, my friend! Osi - one for sale on urbanski forum right now! I wonder if it's the same one i have seen on ebay recently, (faded to about the same as my copy) or another? I have tried repeatedly to register on larry Forum. I used to have a membership on there many years ago, probably still do but I'll be darned if i could figure out what my old passworsd was on there. Could you send me any particulars about it? Web links or such? Below is the screen shot of that particular sale. Nothing you need to worry, Osi as this print is also turning red. Ahhhh yes, that is the one that was offered on ebay over the last few weeks. Actually, if it is on a 1600ft reel, if the reel is completely full, it might well be the full feature, but the fellow did include screenshots from it, so I already know that the color isn't quite as good as what I have right now. Thank you for posting that info. Believe it or not, I worked on the Grizzly Adams TV show (second season, including the Christmas special.) I was a Sound Editor. I edited and even created some of the bear sounds. The bear in reality never made any noise...he was waiting for the trainer to throw him a marshmallow!! But our dictum was “see an animal, hear an animal” so every time the bear opened his mouth, he had to “speak”. A lot of 15ips recording, slowed down to 7.5ips or even 3.75ips and boost the bass, etc., to get Ben’s dialogue! I only got to physically meet the bear (if memory serves, his name was Bozo) once and he was a total ham! Pull out any camera and he started performing! And the bear TRULY did LOVE Dan Haggerty. The bear did things with Dad he wouldn’t do for anybody else. It was a mutual love affair, and it showed on screen. BTW the entire series was filmed in 16mm! No 35mm shooting, ever—except for the first feature, which if memory serves was shot in Techniscope. (“Mountain Man”??) Anyway, it was a surreal 18 months I spent up in Salt Lake City, editing bear dialogue and bird chirps, etc. We cheated the sound a LOT. For example, rabbits don’t make any noise unless you step on them. So we got our supervisor drunk, and he would giggle. We recorded that, sped it up 4x, and you get a high-pitched purr sound...and that became the rabbit’s “dialogue.” And our dictum of “see an animal, hear an animal” made for some interesting edits. A close-up of a raven, for example. It’s beak never moved—so we’d put in a chirp on the eye blinks! Maybe ten years ago I became friends with Jack Ong, who appears on the first two reels of "When the North Wind Blows", the film which led to Dan Haggerty becoming Grizzly Adams. The interesting animals in that one were Siberian tigers. Generally speaking these aren't man-eaters, but Jack was told never to turn his back on one: at an unpredictable moment one might decide to knock you down and take a chunk out of you! David, any memories of Denver, #7 and Don Shanks? That bunch of memories was TOTALLY awesome!!!! May I have you're permission to quote them seomtime in the future in an article? Osi, not sure if you're asking me, but yes you can quote me any time. I have tons of stories, including a few pranks we pulled in post production!! Joe, I never got to meet or work with Don Shanks or Denver Pyle. Never met #7 either. I will say that the entire show was almost 100% looped (ADR dialogue re-recording) because location sound usually had generators, wind, jets flying overhead, etc. So as sound editors we had to do a 100% sound job, everything from footsteps to clothing rustle to you name it. A couple of the stories are quite ribald, but one I can tell here is about the Christmas special. It was the only time they filmed in snow, and for the opening sequence Dan was supposed to play in the snow with the bear. Dan started throwing snowballs at Ben....who promptly chased him down, tackled him, then SAT on Dan and playfully threw snoballs in Dan's face! It was utterly unplanned and unexpected--but like I said, that bear LOVED Dan Haggarty, and Dan was laughing hysterically the whole time. The director just let the cameras roll (I think they were rolling at least 2 or 3) and the sequence is in the show. One of those "happy accidents" that happen once in a blue moon. I see the dvd set of the complete TV series is coming out in the UK ( R2 ) in April this year. You can get the R1 one of the same for around £14/15 posted. I expect the UK on will come down in price, but maybe not that far. David! I love these stories! I already have the complete TV series. I was really happy to see this series released on DVD finally. It does vary from episode to episode, but it is on the whole, MUCH better than the bootleg ones that were originally available.